One of the popular browser extension VPN is MediaHint at the moment. Once you install the extension on your Firefox or Google Chrome browser and enable it (i.e activate the plugin) then you will be done. You don’t have to do anything else. Very simple. Now you can proceed to visit Netflix and register an account. 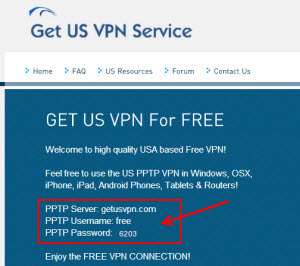 As mentioned, there are many free VPN services on the net, you can just search Google for “FREE US VPN” and pick one. Normally, as shown to the right (screenshot), they will just display the VPN details on the main page directly (inside red box). This option is a bit tricky and needs some setting up to do. You can follow this tutorial on how to setup your VPN. Since you need a stable and fast VPN connection to watch Netflix and Hulu, paid VPNs are the preferred choice among them all. Paid VPN services are of two types; 1) Charge on monthly basis 2) Charge per usage. Depending on your usage, either option would be suitable. For example, if you are going to consume a lot of bandwidth (i.e watch a lot of movies), then monthly subscription is a better option. Personally, I would choose the “pay per usage” option, since mostly my kids would be watching it. And they only watch few hours a day if not less. When I went to China last year, I had subscribed to such VPN service, it’s called Private Tunnel. As you know most of the services are blocked in China, so VPN is one way to stay connected to your family and social network websites. For this particular test, I used my Private Tunnel account, since I had left some unused bandwidth in it. This is the main advantage of “pay per use” accounts, they do not expire and you won’t have to fork out monthly payments to keep it active. My connection at home was Unifi and overall I can say that it was a smooth experience. My kids enjoyed the various shows that Netflix offered. As for the other recommended paid VPN services, you can check here. Connecting to paid VPNs mostly differ from each other, this is because most of them have their own custom softwares to connect. Depending on which paid VPN service you choose, just follow the steps (a guide that is provided) on how to connect to that particular service. Most of them are very straight forward and as simple as entering username and password and pressing “connect”. Netflix and Hulu both provide free trials, for Netflix it’s one month free trial, and I believe for Hulu it’s 7-days. However, both of them will ask you to place your Credit Card on file when registering, which will not be charged until your next billing i.e until your trial period expires. So, don’t forget to cancel the billing if you decide to discontinue the service. I hope you enjoyed this post. Enjoy your Netflix!